From 2000 and for many years thereafter, Marijcke Voorsluijs, the owner of TOT, was responsible for scheduling the technical employees for the Stadsschouwburg Utrecht using Rostarflex, a large scheduling application. This was an expensive program that ultimately delivered, but was not made for events-guided scheduling. A number of fixed shifts were the basis, but that is not how the cultural sector works. The event, performance or concert sets the tone. An opera places different demands on the staff than a classical concert, for example. Further, the program of the day must be visible in the schedule. Strangely enough, even after much searching, there did not appear to be anything on the market between a self-made Excel file that only adds the daily and weekly hours, and very costly programs such as Rostarflex. That was, until 2005. At the Goudse Schouwburg theatre a Zoetermeer-based technician, Albert Kromkamp, saw an advanced Excel file. It contained the first steps in scheduling according to the staff complement requested by visiting companies. At the same time, formulas controlled the scheduling for the maximum work time per day and the minimum daily rest periods, as per the Working Hours Decree. In his free time, Albert built his own variant and fine-tuned it until it did exactly what he wanted: generate events-guided schedules that met the CBA stipulations and recorded sick days, overtime and holidays. It became an ultra-intelligent scheduling and time tracking spreadsheet, a veritable work of art packed with macros and Visual Basic code. 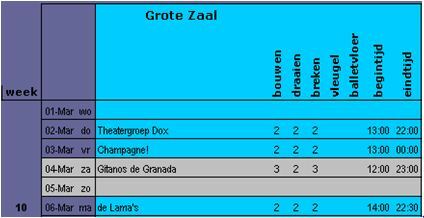 The schedules at the Stadstheater Zoetermeer theatre are still created using this system. Marijcke examined it from every angle and was impressed. She told the Leidse Schouwburg theatre about it, which were more than happy to buy it. Albert wanted to remain the technician that he was, and sold the rights to TOT, who renamed the program Uurwerk and since then has made many clients happy with it. Albert still programs updates and new versions. Read more about the further development of Uurwerk.